Beijing will close off access to part of the South China Sea for military drills, officials said Monday, after an international tribunal ruled against its sweeping claims in the waters. 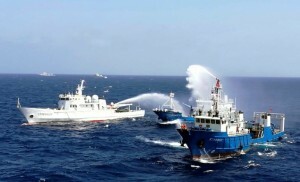 An area off the east coast of China’s island province of Hainan will host military exercises from Tuesday to Thursday, China’s maritime administration said on its website, adding that entrance was “prohibited”. The area of sea identified is some distance from the Paracel islands and even further from the Spratlys. Both chains are claimed by Beijing and several other neighbouring states. The Permanent Court of Arbitration (PCA) in The Hague last week ruled that there was no legal basis for Beijing’s claims to much of the sea, embodied in a “nine-dash line” that dates from 1940s maps and stretches close to other countries’ coasts. Manila – which lodged the suit against Beijing – welcomed the decision but China dismissed it as a “piece of waste paper”. Despite Chinese objections, the European Union weighed in on the subject at a regional summit last weekend, with President Donald Tusk telling reporters the bloc “will continue to speak out in support of upholding international law”, adding that it had “full confidence” in the PCA and its decisions. China pressured countries in the Asean bloc of Southeast Asian nations not to issue a joint statement on the ruling, diplomats said. During a meeting between top Chinese and US naval officials on Monday, Beijing remained defiant, asserting its right to continue controversial construction projects in the Spratly Islands, which are claimed by several countries in the region. “We will never stop our construction on the Nansha Islands halfway,” Wu Shengli, the commander of the People’s Liberation Army Navy, told US counterpart Admiral John Richardson, reported the official Xinhua news agency. Nansha is China’s name for the Spratly Islands. “The Nansha Islands are China’s inherent territory, and our necessary construction on the islands is reasonable, justified and lawful,” Wu added. Beijing held military drills in the South China Sea just days before the international arbitration court ruling, state media reported. A combat air patrol was mounted over the sea recently and these would become a regular practice in future, an air force spokesman said separately. Bombers, fighters and other aircraft were sent to patrol islands and reefs including Huangyan Dao, spokesman Shen Jinke was quoted by the official Xinhua news agency as saying. Huangyan Dao, known in English as Scarborough Shoal, is disputed with the Philippines and is seen as a particular flashpoint. China has rapidly built reefs in the waters into artificial islands capable of military use. In a separate message on its website, the maritime administration said last week that four out of five lighthouses built atop islands and reefs in the sea have been activated, and a fifth would be put into use soon.